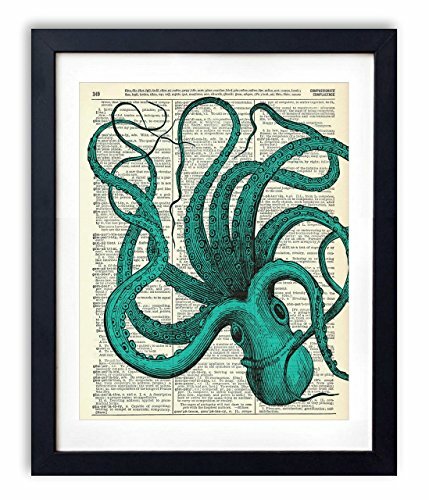 Blue Octopus is a beautifully printed design on an authentic antique dictionary page from the early to mid-1900's. The pages that are used for each print are random pages from a vintage dictionary. Each page has a great antique look and feel. You will receive the exact image shown however the dictionary pages that are used will vary. This makes each print a one of a kind, as no two pages will be exactly the same. Each print measures 8x10 inches unless otherwise noted. Colors may vary slightly from the image shown. The prints DO NOT come framed, but will fit any standard 8x10 frame or any larger frame with an 8x10 matte. Our prints look amazing framed and displayed in any room of your home. They also make great one of a kind gifts! Frame not included. Brand: Vintage Book Art Co. If you have any questions about this product by Vintage Book Art Co., contact us by completing and submitting the form below. If you are looking for a specif part number, please include it with your message.